The Quechee Club is a 4 season development and community in Quechee, Vermont. 2 - 18 hole golf courses, indoor and outdoor pools, a lake with a beach, tennis, paddle tennis, XC ski trails, snowshoe and hiking trails, downhill ski hill and much more is all it has to offer. The place is fabulous - the people even more special. 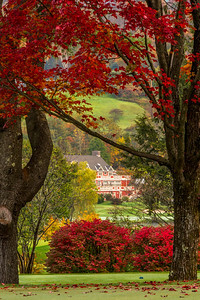 Lake Pinneo shows off the Quechee Club, Lakeland Golf Course adn the surrounding hills during the foliage season. The Quechee Clubhouse taken from the Lakeland Golf Course on a fresh spring day. Early Spring on the golf course is a magical time. The early morning reflections of the trees between Lakeland #9 and #10 is only seen early in the spring before the pond is covered in lily pads. This is the new bridge from 2012 - it replaced the old bridge that Hurricane Irene battered. This new bridge is gorgeous - and will only become more beautiful as it weathers. I caught this as the setting sun was just goingn down and bathing the bridge in golden sunlight. 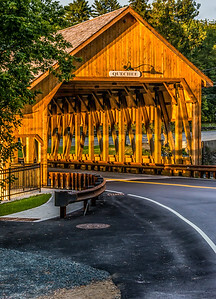 This is the bridge that links the 2 golf courses at the Quechee Club in Quechee, Vermont. This is a wonderful par 3 on the Lakeland Course and early morning mist often rises off the lake. Early one morning on the Highland Golf Course in Quechee - looking back at the clubhouse from near the 7th green. Murphy Farm is a farmhouse at Quechee Lakes and used for weddings and other functions. It sits right on Lake Pinneo and is a fabulous spot to enjoy the day.